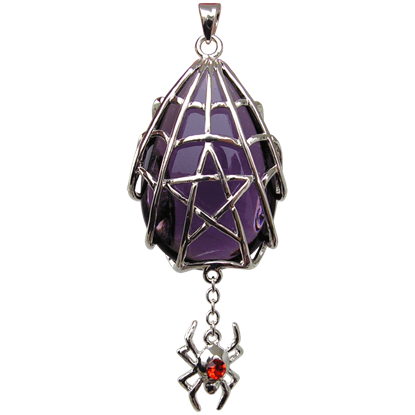 We offer a massive selection of gothic styled spider pendants. We have many styles of these gothic pendants, including variations with webs on them and hanging spiders. 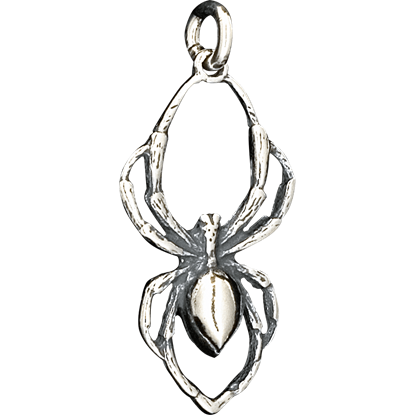 Many of our spider pendants are made of the very best English pewter and have intricate detailing to them. 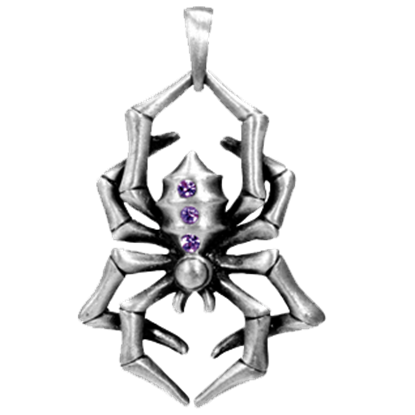 All of our spider pendants make great additions to gothic jewelry collections. 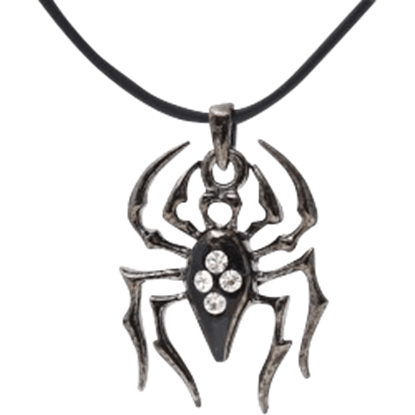 These gothic spider pendants make great gifts for that special someone who loves gothic style clothing and jewelry or someone who loves spiders. 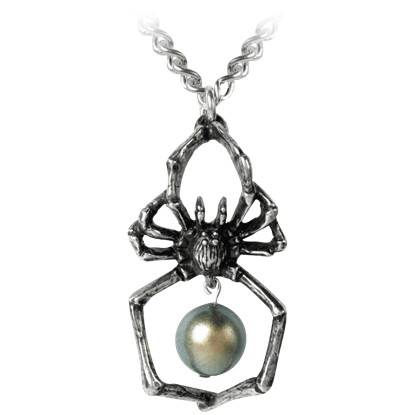 All our gothic spider pendants are great for every day use or for special occasion wear. This is not a fashion accessory for arachnophobes! 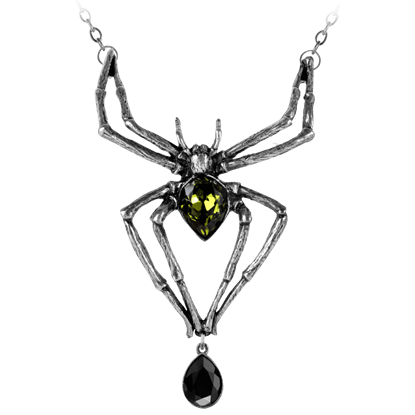 The Black Gem Spider Necklace takes the form of a stylized black widow for a striking look. This gothic necklace makes a unique finishing touch for many different ensembles. 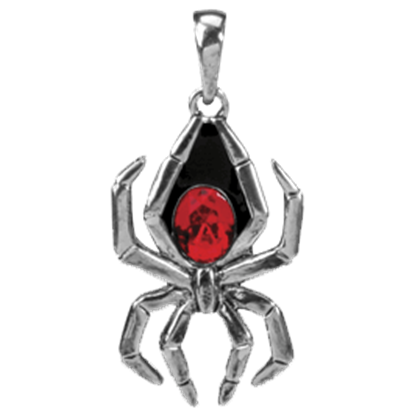 With our Black Widow Spider Pendant, you can adorn your neck with one of the most notorious arachnids around. 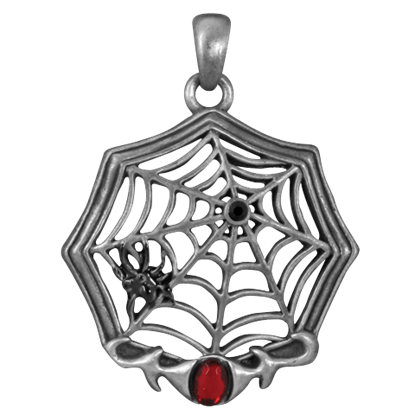 Made of lead free pewter, this charm depicts the spider in style, embellished with a stunning red jewel at its center. The Emerald Venom Necklace depicts a deadly predator, poised to sink its irresistible fangs into the flesh of its unwitting victim. 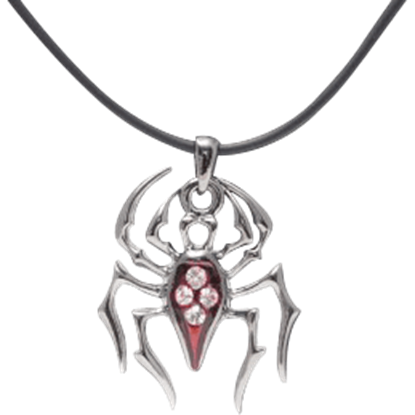 This spider necklace boasts a pair of beautiful Swarovski crystal accents in its design. After spinning an intricate web, this clever arthropod blends into the shadows, awaiting its prey. The Glistercreep Necklace depicts a tiny weaver who not only represents the darker aspects of the soul but creativity and patience. The playful Spider Pendant can be a welcome addition to your personal jewelry collection to enhance any outfit. Dress to impress with this original piece that is sure to draw the attention of your friends. This is not a fashion accessory for arachnophobes! The Red Gem Spider Necklace takes the form of a stylized Black Widow for a striking look. This gothic necklace makes a unique finishing touch for any number of different ensembles. If you are one of the few people who adore arachnids of all kinds, then this is the perfect gothic necklace to show your love! 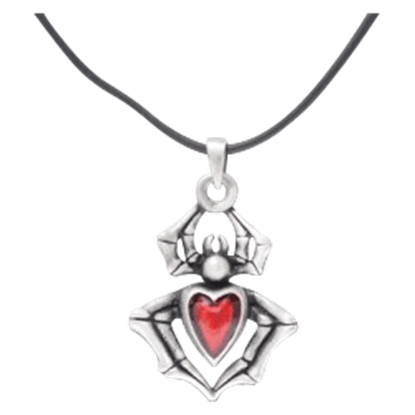 The Red Heart Spider Necklace features a bright red enamel heart over the abdomen of a stylized spider. 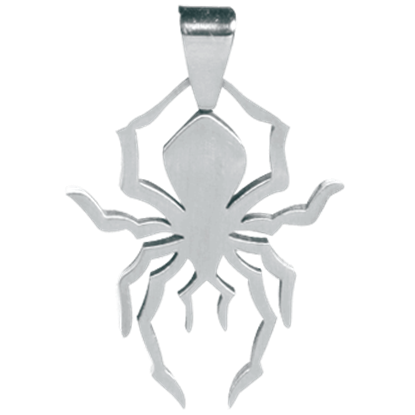 Do not worry - this Silver Arachnid Pendant means you no harm. Instead, it is here to compliment your look. This edgy accent can be a wonderful way to add some flash to your current wardrobe and impress your friends. Made famous by their beautifully crafted webs and occasionally quite deadly nature, spiders are a timeless staple in gothic fashion. Delight in an artistic depiction of the often-feared creature with the Spider Silhouette Necklace. Would you ever dream of letting a lethal spider get close to your person? Why, if they looked as good as the Spider Web Necklace, certainly! Luckily, it will not come to that, as you can just enjoy the style and flair of this pendant. Spiders are well known for the intricate webs they weave, and in this Spyder Star Crystal Keeper Necklace, one arachnid weaves a web that keeps a lovely crystal well-contained, reserving its potential mystic powers for the wearer only. Spiders weave webs to catch their prey. Enjoy the elegant geometry of their deadly traps when you wear the Web Necklace. 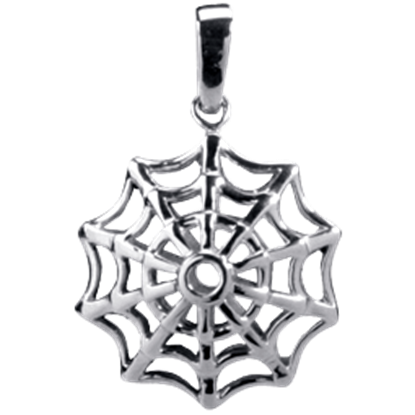 Made of 316L stainless steel, this unique charm features an artistic depiction of a symmetrical arachnid web.